While its name implies a heavily wooded state, Pennsylvania features plenty of farmland and river valleys throughout its expansive mountainous terrain. As far as climate goes, the state experiences warm, humid summers and cold winters, from Pittsburgh to Philadelphia. To put it succinctly, beautiful Pennsylvania is a great place to convert from grid electricity to using solar panel power. Just a few years ago, the Pennsylvania Sunshine Solar Panel Program disbursed rebates amounting to $100 million. These monies were awarded to residences and small businesses that had converted to solar electric or solar hot water. Unfortunately, by November 2013, the funds had been depleted. So while the Keystone State was living up to its name not too long ago in terms of solar progress, it now ranks as average. 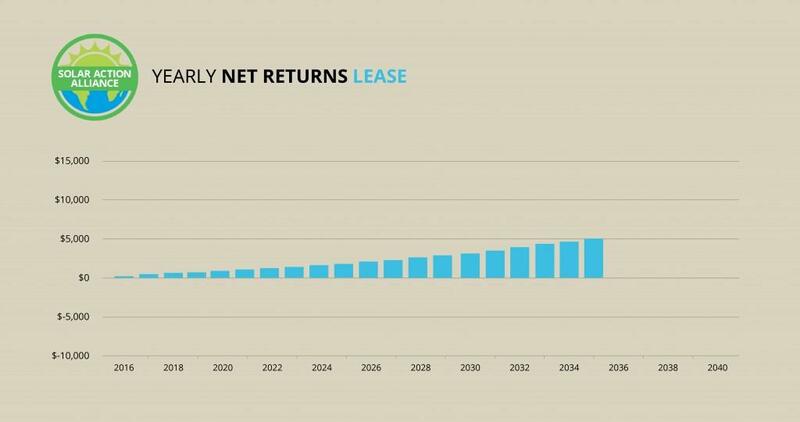 Let’s explore the current situation in the state and see what it means for you as an investor in Pennsylvania solar power. The first piece of good news is that electricity prices are high in Pennsylvania. “How is that good news?” you ask. Well, if you look at the Swanson Effect graph above, you’ll see that solar power was very expensive in 1977. Per-watt costs have come down considerably since then. Therefore, the disparity between the cost of solar power and the cost of standard electricity in Pennsylvania equals money in your pocket. You’ll likely see even bigger savings down the road as electricity prices increase and technology makes solar energy even more affordable. Let’s examine the return on investment (ROI) for a solar-panel installation in Pennsylvania. The graph above shows the 25-year ROI for a solar panel system. We’ve illustrated the ROI for three different payment options: cash, loan, and lease. You’ll see right away that purchasing leaves you with the most money in the end. Nevertheless, you’ll be spending more of your own money during those 25 years than you would with a loan. That’s because you get a 30 percent tax credit from the U.S. government either way. When you buy your system with loan funds and then get your reimbursement, you start out in the black. 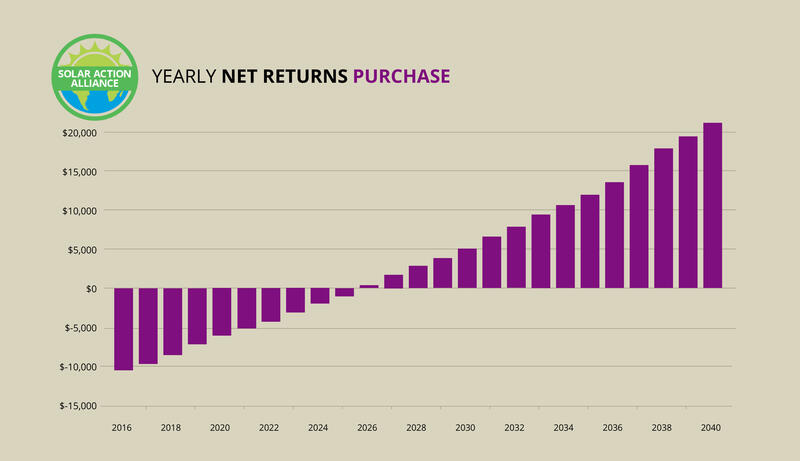 You’ll pay for your new asset over 15 years instead of all at once, just barely dipping into your own money. Even if you’re strapped, you can still take advantage of solar savings through third-party ownership. That means a lease or power-purchase agreement (PPA). You’ll gradually make a small amount of money, because as electricity rates increase every year, your lease payments will increase by a smaller percentage. Read on for details on all three of these options. Again, purchasing solar panels in Pennsylvania with your own money is the most profitable option for going solar. Let’s take a closer look at how an outright purchase works and benefits you. The installation of a brand-new solar energy system in Pennsylvania will set you back almost $17,000. However, thanks to a 30 percent tax credit from Uncle Sam and immediate savings on your energy bill, you’ll have earned a substantial portion of your expenses back at the end of the first year. Because electricity is costly in Pennsylvania, you’ll continue to save money with every passing month and year. At the end of 25 years, you’ll have earned everything back plus an additional $21,000! The reality is that you, along with many other people, might not have an extra $17,000 in the bank. However, you do have some equity in your home. By getting a home-equity line of credit (HELOC) at 5 percent interest with a 15-year payback period, you’ll put no money down on solar panels but still end up with nearly $15,000 at the end of 25 years! Even if you do have cash in the bank, it almost makes more sense to use loan funds to pay for your solar panels in Pennsylvania. That’s because you’ll make a considerable amount of money with no investment. How’s that for ROI? Even if you don’t qualify for 5 percent interest, take time to do the math for a higher rate. It’s most likely worthwhile to go the loan route even so. If you don’t have cash on hand and don’t qualify for a loan to cover to a solar panel system in Pennsylvania, don’t fret. You can still benefit by going solar! In the Keystone State, you have the option of leasing your solar panel system. When you lease a system, you don’t own it. That means you don’t have to worry about maintenance or repairs. You also don’t need a down payment to get your panels in place. Because electricity is expensive in Pennsylvania, you’ll start saving money as soon as you’ve converted to solar—even considering your lease payments! Over about 20 years, you can save almost $5,000. A power purchase agreement (PPA) works similarly to a lease agreement. A third party owns and installs your solar panels, but in this case, you buy your power from this entity and not your local utility company. Whether you opt for a lease or a PPA, your solar energy system will increase your home’s value and contribute to a cleaner planet with almost no investment from you. An RPS is a law that specifies changes in utility company behavior by a certain date. In Pennsylvania, this standard is known as the “Alternative Energy Portfolio Standard” (AEPS). Currently, the state is pushing for utilities to draw 18 percent of their power from renewable sources by 2020. The AEPS in Pennsylvania breaks down this 18 percent further into 10 percent from Tier II sources and 8 percent from Tier I sources. Tier I includes solar and other environmentally friendly sources of energy, such as small-scale hydroelectric and wind. However, the carve-out that specifies solar power is less than 0.5 percent, which is low among states that have solar carve-outs. Furthermore, the Tier-II sources are not necessarily good for the environment. Such sources include coal derivatives and massive, ecologically destructive hydropower. For now, Pennsylvania ranks as a “C” student: not dismal, but not outstanding. The state has gone by many nicknames in the past, having been known for its steel, coal, oil, and chocolate. Unfortunately, Pennsylvania won’t be known as “The Solar State” anytime soon. 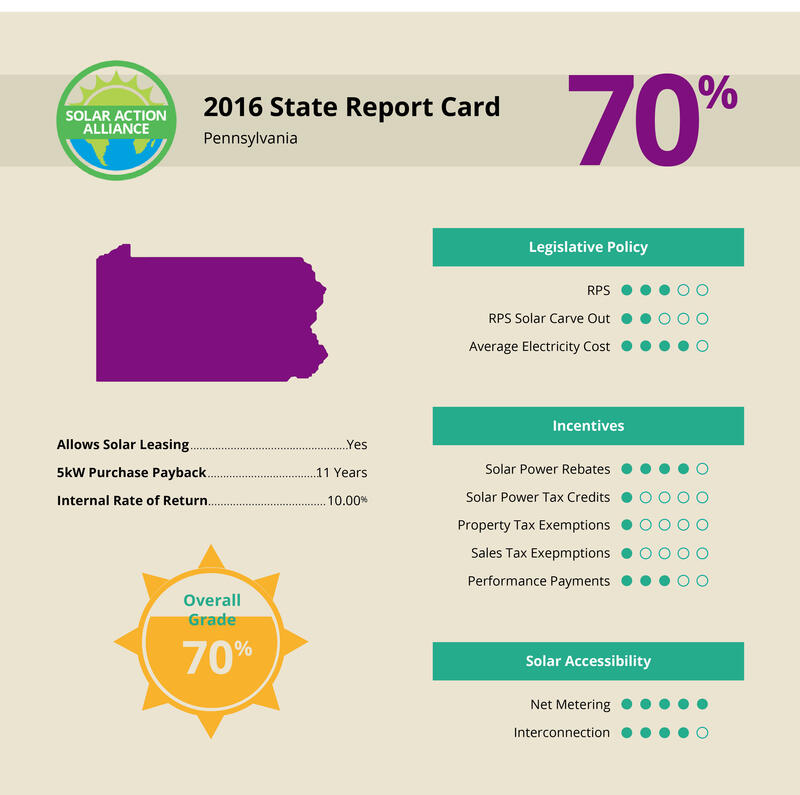 The situation looked good while the PA Sunshine Program was in effect, but it’s uncertain if the Quaker State will attain its previous status as a progressive and solar-friendly state. While Pennsylvania does offer some other strong incentives for converting to solar panels, such as good net metering (utility bill credits for extra power production) and interconnection policies, the state is weak in many other areas. Pennsylvania needs to work on strengthening its sales and property tax exemptions as well as its tax credits.